(Tuesday, July 10th) Uhrichsville, Ohio – A local school district has a new superintendent for the 2018-2019 school year. Claymont School Board members voted 5-0 to approve a three-year contract to hire Scott Golec into the position. Monday evening, he thanked the board for the vote and the community’s support. 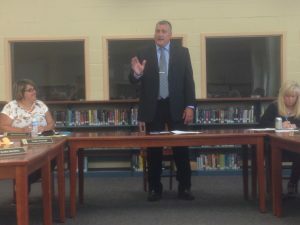 Golec was one of eight candidates who ran for the superintendent job and is hired until July 31, 2021. He previously served as the principal at Claymont High School and Junior High School. Golec replaces John Rocchi, who is moving to a position with the East Central Ohio Educational Service Center.